One of IMA's favourite faces of the Fall/Winter 2014 season, Amanda Wellsh stars in an idyllic editorial for Australian Vogue's July 2014 issue. The veteran model is captured on location in tropical Fiji by photographer Will Davidson for "Wayfinder". 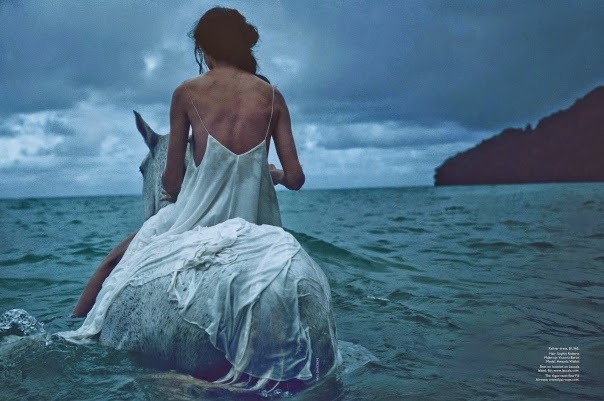 Davidson captures a softer side of the twenty-four year old Brasilian as she poses while setting sail on choppy Fijian waters, perched atop massive pieces of drift wood, and while riding horseback. Fashion Editor Christine Centenera pairs knit sweaters and jackets with summer slip dresses, shirt and swimwear ideal for braving the unpredictable weather conditions from the collections of Chloé, Givenchy, Hermés, Chanel, and Karen Walker. IMA first met Wellsh last September at castings for Natalie Joos and Oscar de la Renta prior to her breakthrough success at the Spring/Summer 2014 collections. The IMG-repped stunner is the latest in a succession of models in their mid-to-late twenties to be embraced by the fashion industry after having taken an extended break from modelling only to return with a renewed focus and vigour. Modelling since the age of fourteen, Wellsh took time out in 2011 to give birth to her son, remerging two years later on the Spring/Summer 2014 runways at Chanel, Gucci, Oscar de la Renta, Helmut Lang, Dries Van Noten, and Balmain. The past year alone has seen Wellsh scoring an exclusive Gucci Spring/Summer 2014 campaign lensed by Mert & Marcus, and blue chip editorial bookings for Paris Vogue, Document, and Russian Vogue.